Oil pricing continues to hover in the mid-$50s, market confidence is slowly returning and the production floater fabrication market is stirring. A major order for a production semi was placed in early January -- with Samsung receiving a contract to build the production semi for BP's Mad Dog Phase 2 project. The $1.27 billion unit will have capability to produce 110,000 b/d oil from 14 production wells. It will be used to develop further oil discoveries near the original Mad Dog Spar in the Green Canyon area of the GOM. This contract brings to a close an eighteen month hiatus in oil production floater orders. The last order (other than for FSRUs and FSOs) was in early July 2015, when Shell contracted with Samsung to build the Appomattox production semi. There has not previously been an FPSO/FPU contracting hiatus of this duration. The previous worse was caused by the global financial meltdown in 2007/08, which resulted in a 12 month dry spell of floater orders. BP's order is the forerunner of an influx of FPSO/FPU contracts as the oil market regains demand/supply balance over the next 12 months. We expect at least a half dozen FPSO/FPU orders by the end of 2017 -- including 2 to 4 new units in Brazil, 1 to 3 in the North Sea and 1 or 2 in SE Asia. Activity also continues to be brisk in the floating LNG sector. In mid-January Hoegh finalized a contract with Samsung to build a 170,000 m3 LNG regas carrier to be used as an FSRU terminal -- and included three option contracts in the order. Hoegh also contracted with Hyundai for a 170,000 m3 regas carrier to be employed as an FSRU in Pakistan. Earlier in the month a 300,000 m3 FSRU was ordered for India and a small FSRU barge was ordered for Indonesia. On the liquefaction side, a major award is imminent for an FLNG for use offshore Mozambique. The $4+ billion contract to be placed with Technip/Samsung/JGC will likely have 1 or 2 option FLNGs. We expect the order to be finalized within the next 30 days. Meanwhile, Petrobras has capitulated on completing the serial FPSO contract program and only five of the eight FPSOs are to be built. Petrobras has not formerly announced that the contracts to build the units have been cancelled – but this is clearly the case. We see the contracts for P 71-73 effectively terminated. The cancellation is bad news for fabricators and suppliers in Brazil. But one benefit did emerge from this situation – expanded opportunities for FPSO leasing contractors. Leased units will be substituted for the three serial hulls that are now history – e.g., the Sepia FPSO now being bid replaces one of the three cancelled serial hulls. And it is unlikely that Petrobras will revisit the local construction acquisition model in the foreseeable future. Most likely future Petrobras FPSO requirements be satisfied by leased units – and in future leases Petrobras will likely reduce the local content requirements realistic targets to lower acquisition cost. 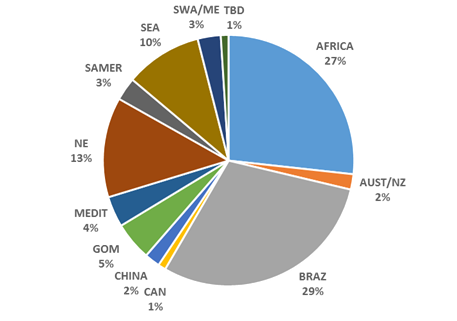 All this and more is covered in WER's January report on the floating production business. In the report are details for 200+ floater projects in the planning stage, 51 production or storage floaters now on order, 284 floating production units currently in service and 28 production floaters available for redeployment contracts. Charts in the report update the location where floating production and storage systems are being planned, operating, being built and to be installed. Accompanying excel spreadsheets provide the report data in sortable format. The search capability allows the user to sort and compile information tailored to a specific requirement. Information in the database is updated on a daily basis from primary sources. For more information, please see our website www.worldenergyreports.com or contact Jean Vertucci at 212 477 6700 or vertucci@marinelink.com. Jim is also the co-founder and editor of IMA/World Energy Reports, a New York based business intelligence service for the floating production industry.